These data are the Goddard Satellite-based Surface Turbulent Fluxes Version-2c (GSSTF2c) Dataset recently produced through a MEaSUREs funded project led by Dr. Chung-Lin Shie (UMBC/GEST, NASA/GSFC), converted to HDF-EOS5 format. The stewardship of this HDF-EOS5 dataset is part of the MEaSUREs project. GSSTF version 2b (Shie et al. 2010, Shie et al. 2009) generally agreed better with available ship measurements obtained from several field experiments in 1999 than GSSTF2 (Chou et al. 2003) did in all three flux components, i.e., latent heat flux [LHF], sensible heat flux [SHF], and wind stress [WST] (Shie 2010a,b). GSSTF2b was also found favorable, particularly for LHF and SHF, in an intercomparison study that accessed eleven products of ocean surface turbulent fluxes, in which GSSTF2 and GSSTF2b were also included (Brunke et al. 2011). However, a temporal trend appeared in the globally averaged LHF of GSSTF2b, particularly post year 2000. Shie (2010a,b) attributed the LHF trend to the trends originally found in the globally averaged SSM/I Tb's, i.e., Tb(19v), Tb(19h), Tb(22v) and Tb(37v), which were used to retrieve the GSSTF2b bottom-layer (the lowest atmospheric 500 meter layer) precipitable water [WB], then the surface specific humidity [Qa], and subsequently LHF. The SSM/I Tb's trends were recently found mainly due to the variations/trends of Earth incidence angle (EIA) in the SSM/I satellites (Hilburn and Shie 2011a,b). They have further developed an algorithm properly resolving the EIA problem and successfully reproducing the corrected Tb's by genuinely removing the "artifactitious" trends. An upgraded production of GSSTF2c (Shie et al. 2011) using the corrected Tb's has been completed very recently. GSSTF2c shows a significant improvement in the resultant WB, and subsequently the retrieved LHF - the temporal trends of WB and LHF are greatly reduced after the proper adjustments/treatments in the SSM/I Tb's (Shie and Hilburn 2011). In closing, we believe that the insightful "Rice Cooker Theory" by Shie (2010a,b), i.e., "To produce a good and trustworthy 'output product' (delicious 'cooked rice') depends not only on a well-functioned 'model/algorithm' ('rice cooker'), but also on a genuine and reliable 'input data' ('raw rice') with good quality" should help us better comprehend the impact of the improved Tb on the subsequently retrieved LHF of GSSTF2c. This is the Daily (24-hour) product; data are projected to equidistant Grid that covers the globe at 1x1 degree cell size, resulting in data arrays of 360x180 size. A finer resolution, 0.25 deg, of this product has been released as Version 3. The GSSTF, Version 2c, daily fluxes have first been produced for each individual available SSM/I satellite tapes (e.g., F08, F10, F11, F13, F14 and F15). Then, the Combined daily fluxes are produced by averaging (equally weighted) over available flux data/files from various satellites. These Combined daily flux data are considered as the "final" GSSTF, Version 2c, and are stored in this HDF-EOS5 collection. There are only one set of GSSTF, Version 2c, Combined data, "Set1" The "individual" daily flux data files, produced for each individual satellite, are also available in HDF-EOS5, although from different collections: GSSTF_Fxx_2c, where Fxx are the individual satellites (F08, F10, etc..) The input data sets used for this recent GSSTF production include the upgraded and improved datasets such as the Special Sensor Microwave Imager (SSM/I) Version-6 (V6) product of brightness temperature [Tb], total precipitable water [W], and wind speed [U] produced by the Wentz of Remote Sensing Systems (RSS), as well as the NCEP/DOE Reanalysis-2 (R2) product of sea skin temperature [SKT], 2-meter air temperature [Tair], and sea level pressure [SLP]. Relevant to this MEaSUREs project, these are converted to HDF-EOS5, and are stored in the GSSTF_NCEP_2c collection. Please use these products with care and proper citations, i.e., properly indicating your applications with, e.g., "using the combined 2001 data file of Set1" or "using the 2001 F13 data file". APPENDIX SET1 --------------- The following list summarizes individual satellites used to produce the Combined SET1. (1) Y1987/: F08/ 1987/07-12: F08 (Note: 1987/12 is filled with missing value due to data scarcity) (2) Y1988/: F08/ 1988/01-12: F08 (3) Y1989/: F08/ 1989/01-12: F08 (4) Y1990: F08/ F10/ 1990/01-12: F08 (Note: F10 started in 1990/12, but N/A due to data scarcity) (5) Y1991/: F08/ F10/ 1991/01-12: F08+F10 (6) Y1992/: F10/ F11/ 1992/01-12: F10+F11 (7) Y1993/: F10/ F11/ 1993/01-12: F10+F11 (8) Y1994/: F10/ F11/ 1994/01-12: F10+F11 (9) Y1995/: F10/ F11/ F13/ 1995/01-12: 01-04: F10+F11 05-12: F10+F11+F13 (10) Y1996/: F10/ F11/ F13/ 1996/01-12: F10+F11+F13 (11) Y1997/: F10/ F11/ F13/ F14/ 1997/01-12: 01-04: F10+F11+F13 05/01-11/14: F10+F11+F13+F14 11/15-12/31: F11+F13+F14 (12) Y1998/: F11/ F13/ F14/ 1998/01-12: F11+F13+F14 (13) Y1999/: F11/ F13/ F14/ 1999/01-12: F11+F13+F14 (14) Y2000/: F11/ F13/ F14/ F15/ 2000/01-12: 01/01-05/16: F11+F13+F14+F15 05/17-12/31: F13+F14+F15 (15) Y2001/: F13/ F14/ F15/ 2001/01-12: F13+F14+F15 (16) Y2002/: F13/ F14/ F15/ 2002/01-12: F13+F14+F15 (17) Y2003/: F13/ F14/ F15/ 2003/01-12: F13+F14+F15 (18) Y2004/: F13/ F14/ F15/ 2004/01-12: F13+F14+F15 (19) Y2005/: F13/ F14/ F15/ 2005/01-12: F13+F14+F15 (20) Y2006/: F13/ F14/ F15/ 2006/01-12: F13+F14 (21) Y2007/: F13/ F14/ F15/ 2007/01-12: F13+F14 (22) Y2008/: F13/ F14/ F15/ 2008/01-12: 01-07: F13+F14 08-12: F13 Special notes: (a) For Y2006, Y2007 and Y2008, the current Combined daily data files do not include the F15 Individual daily data files due to problematic calibration in F15. The Combined daily files will be updated for those three years once an improved set of Individual daily data files are produced using corrected and updated SSM/I F15 input files. (b) The current Combined daily data files are produced with at most 4 combined satellites, i.e., F10, F11, F13 and F14 for May-Nov 1997, and F11, F13, F14 and F15 for Jan-May 2000. The daily temporal and one-degree spatial resolution of the product can be used to examining climate variability at these scales. The global water cycle's provision of water to terrestrial storage, reservoirs, and rivers rests upon the global excess of evaporation to precipitation over the oceans. Variations in the magnitude of this ocean evaporation excess will ultimately lead to variations in the amount of freshwater that is transported (by the atmosphere) and precipitated over continental regions. The air-sea fluxes of momentum, radiation, and freshwater (precipitation-evaporation) play a very essential role in a wide variety of atmospheric and oceanic problems (e.g., oceanic evaporation contributes to the net fresh water input to the oceans and drives the upper ocean density structure and consequently the circulation of the oceans). Information on these fluxes is crucial in understanding the interactions between the atmosphere and oceans, global energy, and water cycle variability, and in improving model simulations of climate variations. 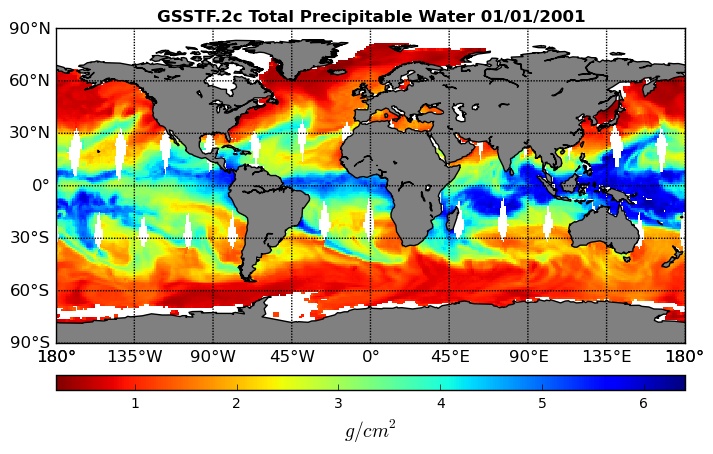 The GSSTF dataset has been widely used by scientific communities for global energy and water cycle research and regional and short period data analysis since its official release in 2000/2001. Accurate sea surface fluxes measurements are crucial to understanding the global water and energy cycles. The oceanic evaporation that is a major component of the global oceanic fresh water flux is particularly useful to predicting oceanic circulation and transport. Remote sensing is a valuable tool for global monitoring of these flux measurements. The GSSTF algorithm has been developed and applied to remote sensing research and applications. We are looking forward to serving the scientific communities with another useful dataset in GSSTF2c.